By Sri Swamiji’s Grace, one of the very vital projects, undertaken by our various institutions, with the support of donors, is renovation of ancient temples. Especially, those temples that have been sung by Azhwars, Nayanmars and other great Mahatmas. 20-25 years ago, in the late 90s, when Sri Swamiji was travelling with some devotees in the Sirkazhi belt, in Southern India, having darshan at various kshetras (divya desams), at the avatara sthala of Thirumangai Azhwar, in Tirunangur regions, the temples were in a very dilapidated condition. Sri Swamiji was in tears seeing how Bagavan was left in such dilapidated conditions, unattended to. “You are the mother and father who can save the whole world. But we people of this world, are so selfish, that we are all taking good care of ourselves, but have forgotten you”. So saying, Sri Swamiji was moved to tears. Sri Swamiji became very restless. The condition of these temples was so dilapidated that there were no facilities for conduct of pooja, they were broken and in very bad shape. That night Sri Swamiji had divine visions in which he could feel all the archavatars in all these temples were so full of life and saanidyam (divine vibes). Inspite of being left in such a neglected state, Sri Swamiji could feel how full of saanidyam all those archavataras were. After this, Sri Swamiji took up the renovation of these temples, one by one, with necessary permissions from the relevant donors. Subsequently, Smt Jayanthi Janakiraman Ninaivu Dravida Veda Agama Patasala was started and a separate trust was established named after Shrimathi Jayanthi Janakiraman, founder of Premika Bavanam. In that patasala students are taught 4000 divya prabandhams, vaishnava aagama and vedas. 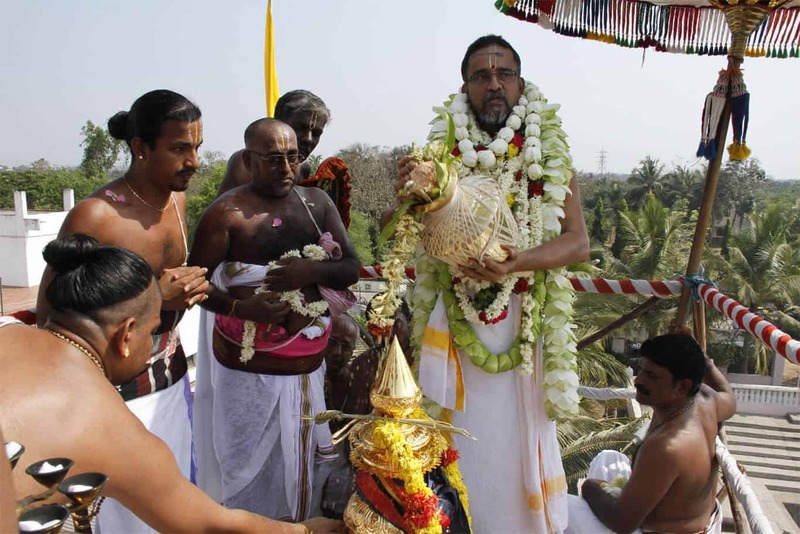 In addition to temple renovation, we are also involved in the regular maintenance, supply of materials needed for pooja, starting from oil for the lamps, vasthram for the deities, creating nandavanams and pushpa kainkaryam and all other requirements of day to day maintenance are taken care by our trusts inspired by Shi Swamiji. The famous Triplicane Sri Parthasarathy Swami temple, has been renovated twice as donor work under Sri Swamijis guidance. Vittalapuram Temple, near Kalpakkam on the East Coast Road is under the control of the Archaelogical Survey of India. It was built during the reign of Ramaraya, brother of Krishna Deva Raya during the Vijaynagara Samrajya. The Panduranga deity there is so full of saanidhya. This Panduranga conveyed to Paranur Mahatma Sri Sri Krishna Premi Swamigal and also to our Swamiji that He was amidst ruins and ordained that the temple be renovated. The place was searched for and found and renovation kainkarya was done. It has been declared as a model renovation by the Tamil Nadu State Archeology department.